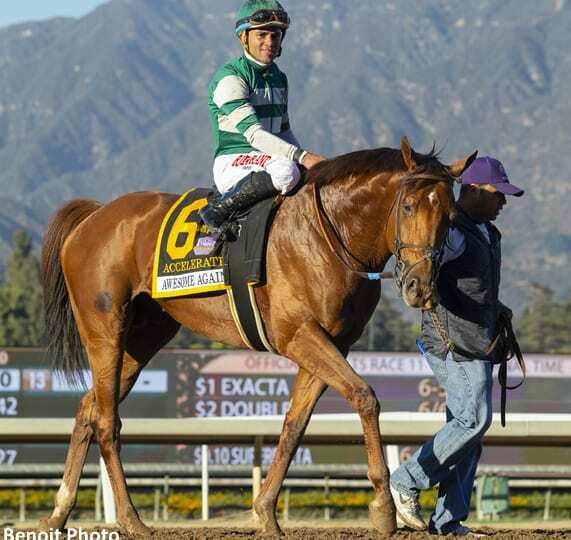 Will Accelerate prevail in this year's Breeders' Cup Classic? Accelerate, who enhanced his status for Horse of the Year honors with an authoritative 2 ¼ length triumph as the 3-10 favorite in Saturday's Awesome Again Stakes, came out of the race fine and it's on to the Breeders' Cup Classic on Nov. 3 for trainer and owner Hronis Racing. Bob Baffert said West Coast got what he needed from his second-place finish behind Accelerate in the Awesome Again and it's on to the Breeders' Cup Classic. It was the first race for champion West Coast since last March 31, when he was second in the Dubai World Cup. Baffert's other Classic probable, McKinzie, lost a bit of weight after shipping to win the Pennsylvania Derby, according to drf.com. However, the six-week period between his victory and the Classic should give Baffert enough time to have the 3-year-old colt ready to go. Sadler's Breeders' Cup Dirt Mile favorite, Catalina Cruiser, meanwhile, worked five furlongs Sunday in 59.80 under assistant trainer and former jockey Juan Leyva. This entry was posted in Breeders' Cup, NL List and tagged accelerate, awesome again, Bob Baffert, Breeders' Cup, breeders' cup classic, catalina cruiser, john sadler, santa anita, west coast by Ed Golden/Santa Anita. Bookmark the permalink.